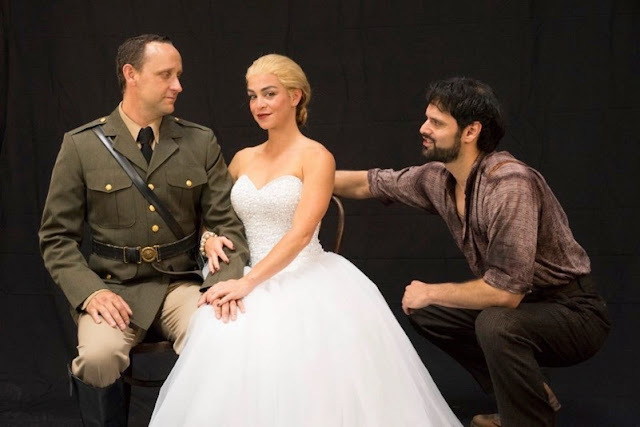 Carol's Theatre Reviews ~ It's Fun To Go Out: “Evita”: ‘High Flying and Adored” at San Diego Rep.
“Evita”: ‘High Flying and Adored” at San Diego Rep. Artistic director Sam Woodhouse in partnership with San Diego School of Creative and Performing Arts have teamed up once again, (“In The Heights”) to bring us a rather fresh look at Andrew Lloyd Weber (Music) and Tim Rice (Lyrics) ageless musical, “Evita”. The original 1979 Broadway hit is making a loud bang at the San Diego Repertory Theatre through Aug 27th. A great number of those in the audience on opening night, mostly supporters and family of students from School of Creative and Performing Arts, might be seeing this now classic for the first time. 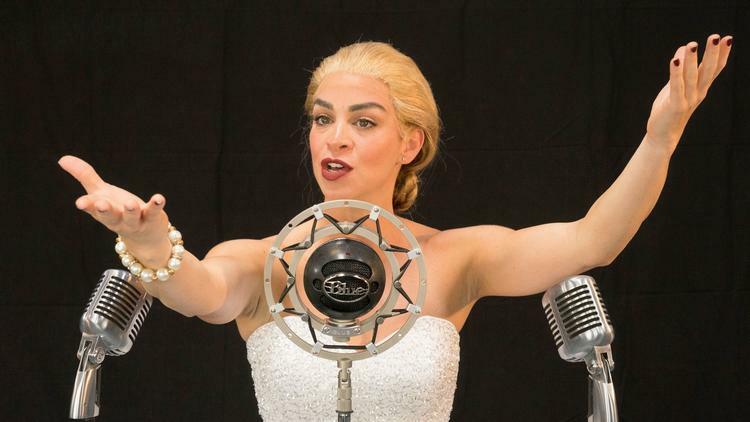 Marisa Matthews is Evita Duarte Peron. Recapping the story, it follows the ambitious Eva Duarte (Marisa Matthews) from her street poor beginnings to her ultimate pie in the sky position as first lady of Argentina. After bedding him, his career takes off. She rallies the working class, and becomes more popular than Perón himself. His rise to the presidency is all due to her popularity. (“The Art of the Possible”, “I’d Be Surprisingly Good For You” and “A New Argentina”). She toured Europe in what was referred to as her Rainbow Tour. (“Rainbow High”, “Santa Evita”) She was greeted with awe, curiosity and admiration in the beginning, but her fame started to wane when the Pope shunned her (called her a whore) and she was snubbed in England. Back home in Argentina (“Don’t Cry For Me Argentina”) she was the most loved, and admired woman in all of South America. It made no difference what she did her followers never lost faith in her. At the time of her untimely death, Argentina was a bankrupt country pretty much the condition she found it when she arrived there, but she always looked like a million dollars. When her health took a turn for the worse she struggled to gain the upper hand, even insisting that she be elevated to Vice President. She died at age 33 from ovarian cancer, even thought she maintained a strong presence in the country. To her credit and amazing determination Matthews’ Evita (who stands no higher than maybe five feet) is a force with which to be reckoned. She’s fierce, plucky and gusty. 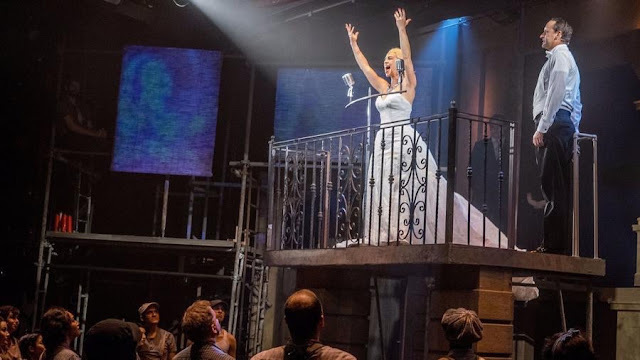 As Evita she is undaunted by the snubs and sneers of the upper class as she pushes her way through the mazes set before her and follows her own instincts appealing to labor and the working class. Not to be minimized either she knocked it out of the park with her extensive musical range in belting out “A New Argentina”, “Rainbow High, “High Flying Adored” and evoked sympathy with “You Must Love Me’. On the flip side of the coin, the political extremist Che “Oh What a Circus” Guevara (Jeffrey Ricca), the everyman social conscience of the middle class workers, is constantly in the background challenging and raising the bar bringing out the hypocrisy, mocking her every move; her words and works as she takes advantage of every opportunity open to her. 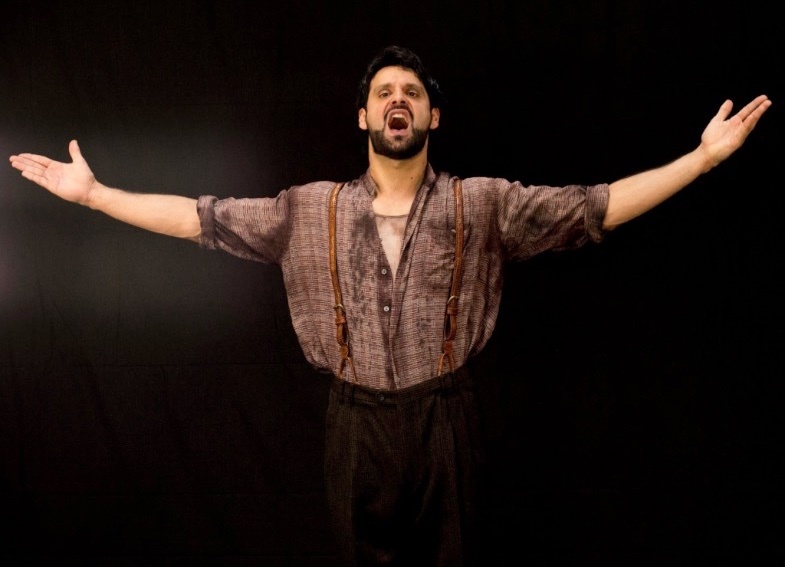 Ricca’s strong voice (I would have liked him to be more charismatic) and stealth like moves puts him all over the theatre; audience here, balcony there, scaffolding, shadow dancing and in her face without so much as a touch. Sean Fanning’s minimalist set is a stark reminder of the poverty in the country. Choreographer Javier Velasco (his footprints are all over the fantasy dance as the two (“Waltz For Two”) are locked in a gorgeous waltz that is spellbinding. Velasco also does wonders with student ensemble of no less than ten that are all on board with “The Art of the Possible”, “Rainbow Tour” and the regular ensemble that includes Steve Gunderson, Kurt Norby Brian and Charles Feldman to name a few. Woodhouse does an exemplary job placing and moving his large cast with clarity. Credit Blake McCarty with the projections, Jennifer Brawn Gittings, costumes David Lee Cuthbert, lighting, and Matt Lescault-Woods with the sound design. Musical director Andrew Bearden, with Lisa May conducting the more than a dozen musicians, is up to the task. 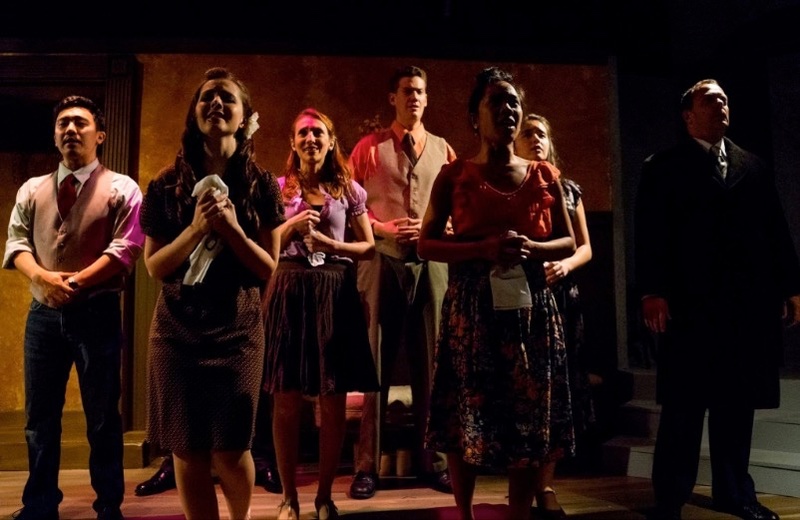 Seeing the young folks involved, engaged and showing off their talent gives me hope that future generations will soon be carrying the torch bringing live performance to a theatre near you. It all came together when one of the youngsters, standing on the rim of the stage was singing her heart out when I noticed the braces on her teeth. That’s show biz! You go girl!